2014 has been a busy year so far and since OPEN PLATFORM_5 we have been engaged in many other projects and developments. We will be back with new editions of Technology without Technology next year - watch this space! The saddest news reached us in May when Sunshine Gray, sound artist, friend and OPEN PLATFORM collaborator and supporter passed away. To applaud her and honour her contribution to OPEN PLATFORM we are breaking our principle of not publishing video documentation: you can watch Sunshine's performance 'Body Sounds II/Audience' here. Jake Harries and Susanne Palzer will be staging a mini OPEN PLATFORM at Sunshine's Memorial Celebrations in Lincoln on Friday, 21 November. Throughout her life Sunshine touched on the lives of an uncountable number of people with her work as a musician and sound artist and as an amazing person. She will be missed by everyone. In July we, Alex McLean and Susanne Palzer, presented a preview of our new live coding experiment 'On-gaku' at Bloc Projects, Sheffield. In our second collaboration Alex was back to using his laptop rather than knitting needles ('Binary Transmission', Open Platform_4) while I performed 'On/Off' alongside his live coding with Tidal. However, this time we connected a pressure sensor to my platform so that Alex' screen was only projected while I was 'on'. As Alex worked with a wireless keyboard he had to cope with only seeing the code he was editing for fleeting moments. In joining our individual practices in this way our difficulty was more visible on both sides. In his case, he could not see his screen for most of the time and my physical exertion became clear. In September I attended the very interesting Live Coding and Collaboration Symposium in Birmingham, organized by Live Code Research Network. Presentations were given by Tom Hall on live digital notation, Scott Wilson and Norah Lorway on live coding networked music, Alex McLean on collaboration, André Damião on streaming objects, Pam Burnard, Franziska Florak, Alan Blackwell and Sam Aaron of the Sonic Pi research project, and Sang Won Lee on models of networked live coding. Especially enjoyable for OPEN PLATFORM were the live sessions on live coding without computers - a playful and unexpected experience in the context of the symposium. 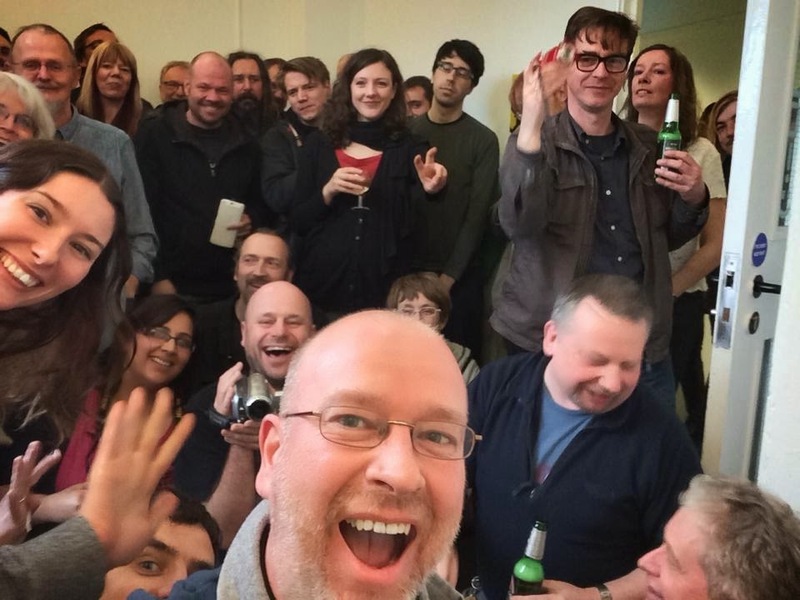 Alex McLeans' 'Reflections on live coding collaborations' can be found here. We look forward to seeing you at a rebooted OPEN PLATFORM event in 2015! We applaud and honour Sunshine Gray, sound artist, friend and OPEN PLATFORM collaborator and supporter who sadly passed away in May. Throughout her life Sunshine touched on the lives of an uncountable number of people with her work as a musician and sound artist and as an amazing person. She will be missed by everyone. We are waving goodbye to choreographer Kate Sicchio who is leaving Sheffield, UK for the States. A big thank you for her involvement with OPEN PLATFORM so far - for performances, collaborations and valuable input into thought processes! Kate will be our TwT.woman in NYC. Watch this space! More about Kate's work and upcoming events here. Kate Sicchio preparing to perform Pure Data Dance at OPEN PLATFORM_2. Asynchronous Transmission by Kate Sicchio and Susanne Palzer for OPEN PLATFORM_4. Kate Sicchio pressing 'Enter' to execute shell script for OptionX by On Off Trio at OPEN PLATFORM_5. Testing Timelapse set up - with Richard Bolam and Alex McLean. Good Luck from all at OPEN PLATFORM! A big thank you to all the performers and anyone who came to OPEN PLATFORM_5/RAP(s) - TwT.hashbangbinbash -x. You made our fifth event a great success! 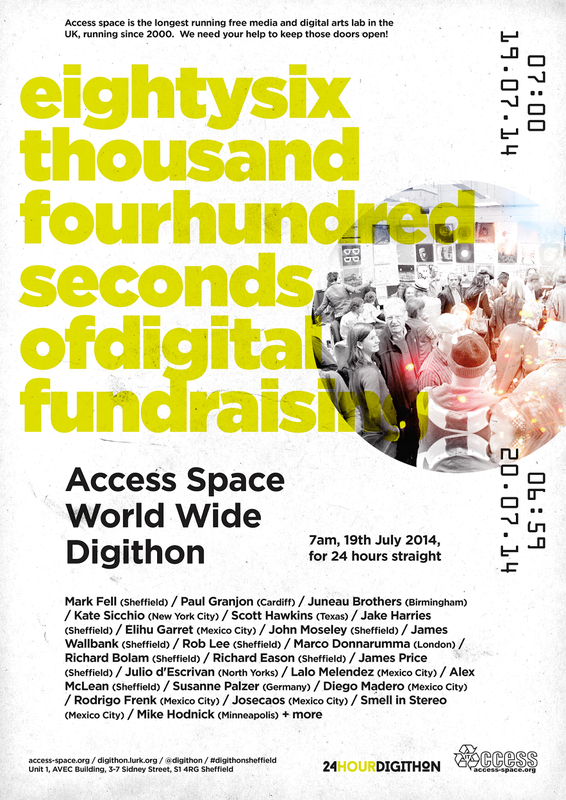 We were also delighted to welcome the Pixelache Network to Access Space! OPEN PLATFORM_6 will take place later this year and we look forward to seeing you there! If you would like to present or perform please get in touch with Susanne or Jake. 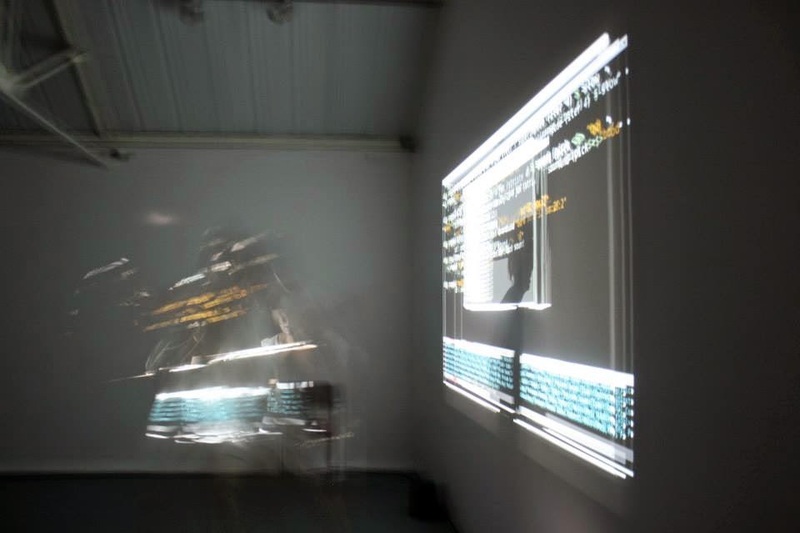 OPEN PLATFORM_4 opens with a collaborative experiment in live coding without electricity. For the duration of 10 minutes Alex McLean transcodes every step of my binary on/off movements into a knit or pearl and produces a piece of fabric which represents the live performance. 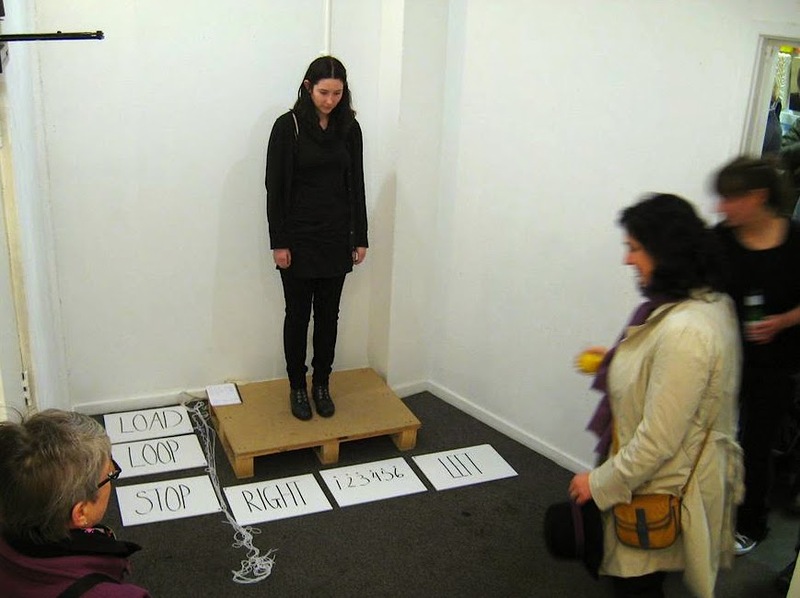 To allow for the 'human transcoding' by knitting I perform a slowed down version of a performance piece in which I step on and off a platform. The collaboration brings together elements of Alex' ongoing research into 'the binding of analogue and digital forms in the context of computer programming' and my current practice of investigating into the fusion of digital technology and physical performance. On/Off is a series of performances which explore the intersection between performance and technology by deconstruction. 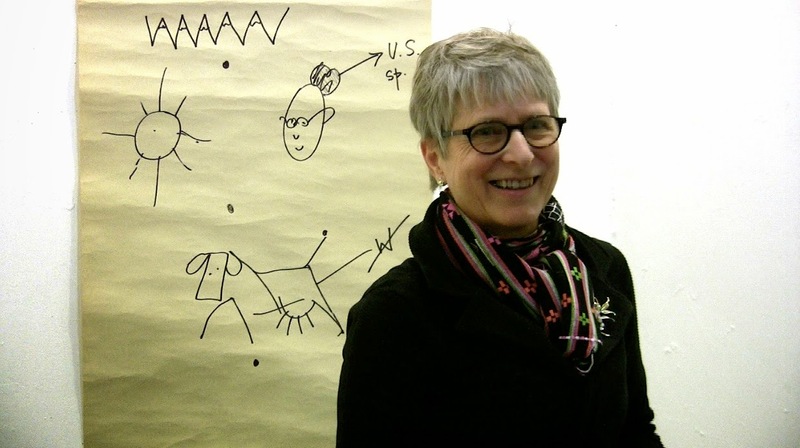 Some thoughts on Alex McLean's 'knitting metaphor' can be found here. Next on the platform is Eddy Dreadnought presenting a spoken piece. Apparently drawing on his "complete lack of knowledge" of how computers work he reads us an enlightening story about silicon. 'Motherboard' follows on from 'Embryonic Thought' which he performed at Manchester Science Festival in November. Message two: 'silicon language is spelled in letters, but also numbers and algebra, punctuation symbols and symbols from keyboards like percentiles and money, and symbols from playing cards and from any alphabet, Arabic, Armenian, Cyrillic, Greek. And it has words for breathing, and pauses and stress, and the inscrutable intonations of Mandarin. And sometimes passages of volatile bits, its cells of zero and one, hoop and stick, all clicking like the consonants of Africa. And sometimes silicon language is in colour, and sometimes hovers over the screen as spatial as the helter-skelter of DNA'. The final message: 'the best silicon languages, though stripped of metaphor, can put into words inexpressible ideas, to become poetry. Recursively rhythmic like music or perseverating like Gertrude Stein. Esoteric languages whose vocabulary is the white space between words, or the movement between twenty modernist colours. or squares of cells like Vermeer chequerboard tiles.' ..."
Shortly after Eddy's performance a strange packet arrives and completes an asynchronous transmission from New York! Over the duration of four weeks, and based on a digital transmission that uses 'packet switching', Kate Sicchio sent several 'coded packets' by post from across the Atlantic to different recipients in Sheffield. All have brought their 'packets' with them to OPEN PLATFORM_4. Now a 'terminal' has to be 'unzipped' and placed on the platform. 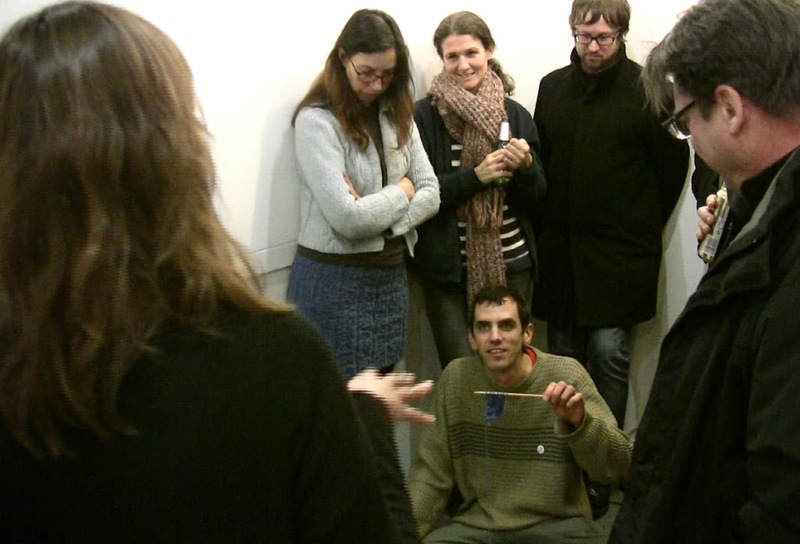 The 'packets' are being 'switched' between audience members, then assembled together in the correct order and finally 'presented at the terminal'. Contained within the 'packets' are cards with binary code on one side and a corresponding letter on the other. Once all cards are in place on the 'receiving terminal' the message is revealed: "Hello World"! We are currently developing OPEN PLATFORM/RAP(s)-TwT. into a mobile platform and our intention is to build a digital network with physical means. Asynchronous Transmission was conceived and devised in dialogue with choreographer Kate Sicchio exploring the possibilities for remote performances without live transmission. A brief technical description of 'asynchronous transmission' can be found here. 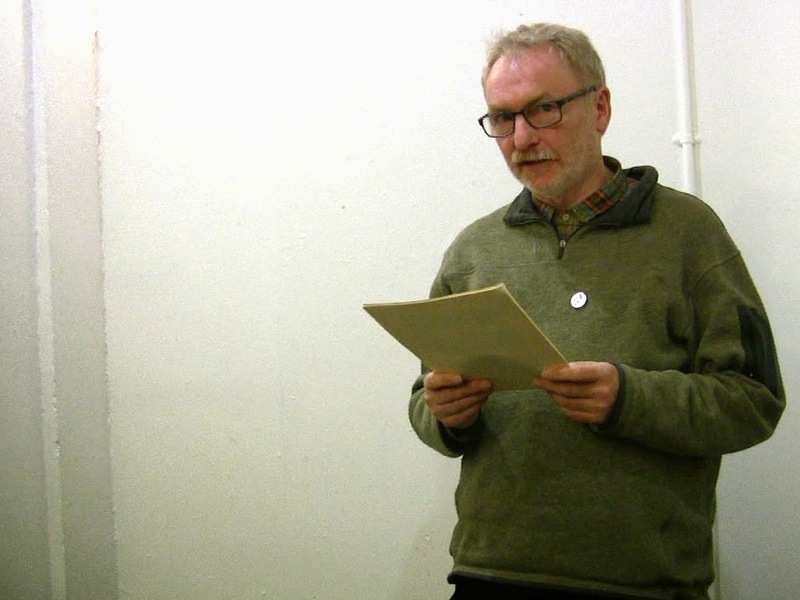 Straying slightly from his usual practice, which involves performance and the use of Processing and Csound, Brian G. Gilson performs a poem for his first appearance at OPEN PLATFORM: 'if-then' is an entertaining and clever simulation of a sonnet written using a two state cellular automaton. With tinsel, santa hat, western union forms and a guitar Jake Harries brings festive spirit to OPEN PLATFORM_4. An expert in 'living the spam' he updates us on his latest romantic adventures and closes the event sharing his pre-Christmas joy! 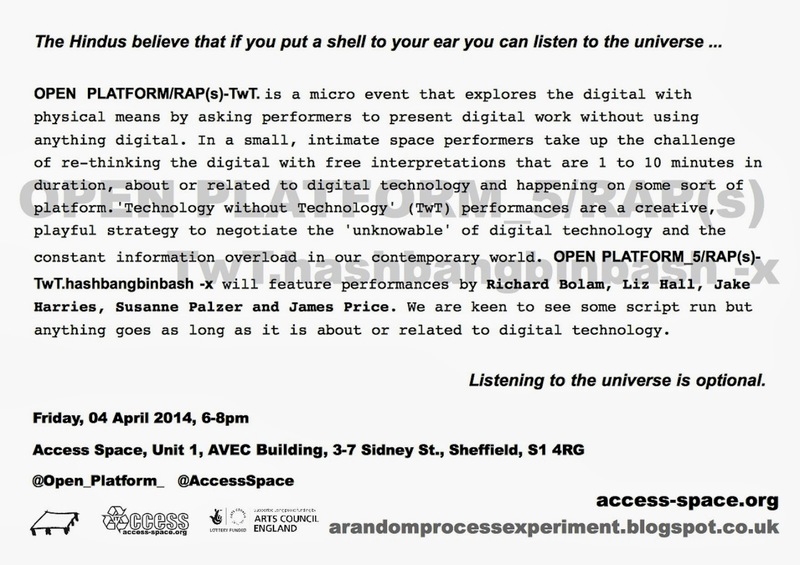 OPEN PLATFORM_5 will take place on Friday, 04 April 2014 at Access Space. OPEN PLATFORM is an ongoing open call. If you are interested in taking part/performing at a future event please email Susanne or Jake.